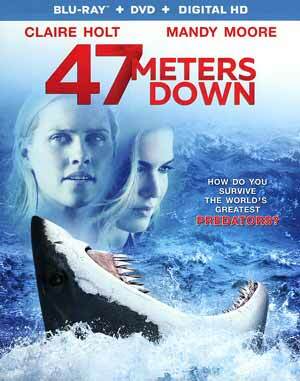 47 Meters isn’t that good of a movie but there were a few tense moments so even with a thin plot and mostly one-dimensional characters, this might be worth a rental especially considering its short running time. Note: This review contains plot SPOILERS. Plot Synopsis: Sisters Lisa (MANDY MOORE) and Kate (CLAIRE HOLT) are having a good time in Mexico after Lisa’s boyfriend breaks up with her for being “boring”. So to lift up her spirits, Kate takes her sister out for a night on the town where they meet Javier (CHRIS J. JOHNSON) and Louis (YANI GELLMAN) who invite them for a shark sight-seeing expedition, involving locked in a cage and going down five meters to observe killer whites, despite Lisa not having any diving experience. After some initial resistance, Lisa agrees to go. The two guys go with no issues with Lisa and Kate going next. Things go well at first, but when the rig holding the line goes, the pair tumble into the darkness below, 47 meters deep in fact, and the rig rips off the boat landing on the cage. 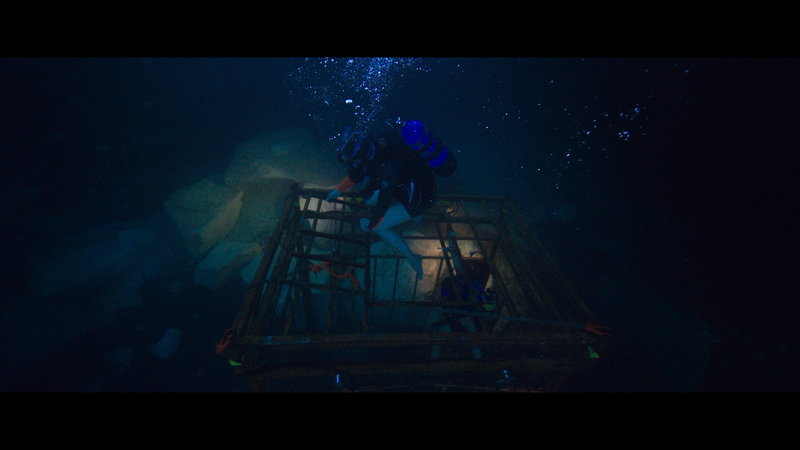 What follows are the girls trying to stay calm to preserve their oxygen before trying to figure a way out of the cage, to make contact with the boat and its captain (MATTHEW MODINE), as that far down they are out of communication range. But outside the cage, they must avoid the great white killer sharks. Review: 47 Meters Down is exactly the movie you think it is. This isn’t a film that features amazing performances, though both Mandy Moore and Claire Holt, are fine and the plot isn’t all that involved, and thankfully it is simple rather than having, say, Modine’s captain character being some sort of villain. However, even clocking in at around 86-minutes, without credits, this is incredibly thin with the story and even the finale with a “twist” that was far too predictable and not as emotional that I think the filmmakers wanted. In the end, 47 Meters Down is an okay film. I guess as Moore and Holt weren’t bad, I can’t say this will ever be rewatched but given the short running time and some genuine tension here and there, it’d be an acceptable rental but nothing more than that. This release comes with a semi-glossy slip cover and inside is a redemption code for the Digital HD copy. 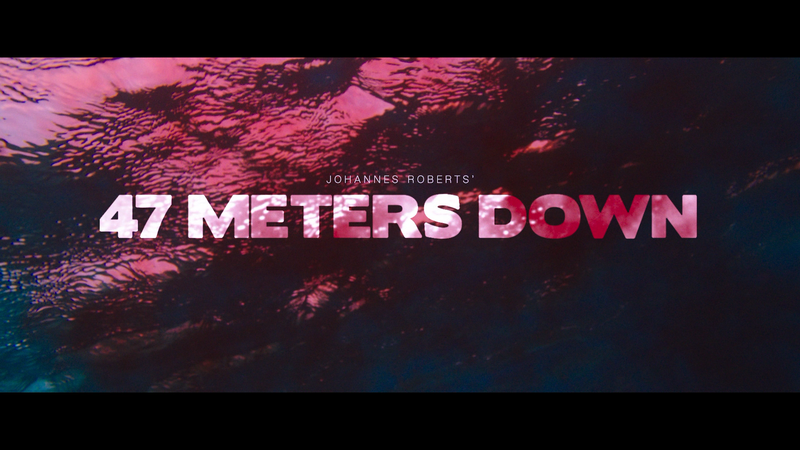 The features are on the lighter side with an Audio Commentary with Co-Writer/Director Johannes Roberts & Producer James Harris, and Unexpected Origins: The Making of 47 Meters Down (11:12; HD), a behind-the-scenes featurette showcasing how some scenes were filmed underwater. 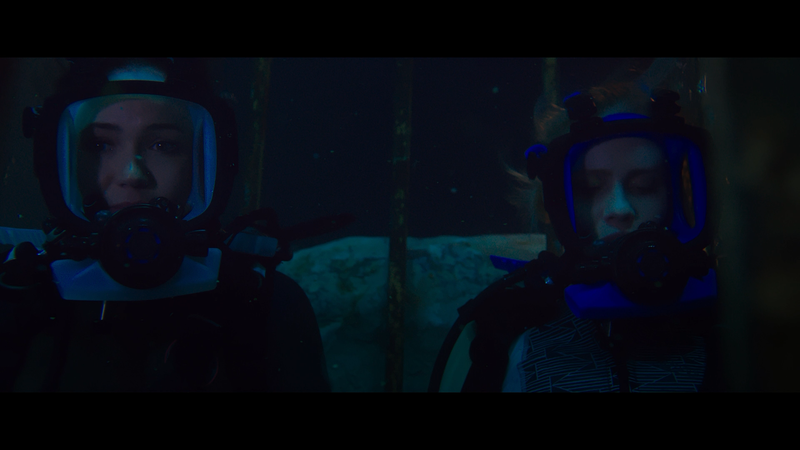 47 Meters Down dives onto Blu-ray presented with a 2.40 widescreen aspect ratio and a 1080p high-definition transfer. For the most part this is a fine looking picture that has good detail levels and colors are generally vibrant. 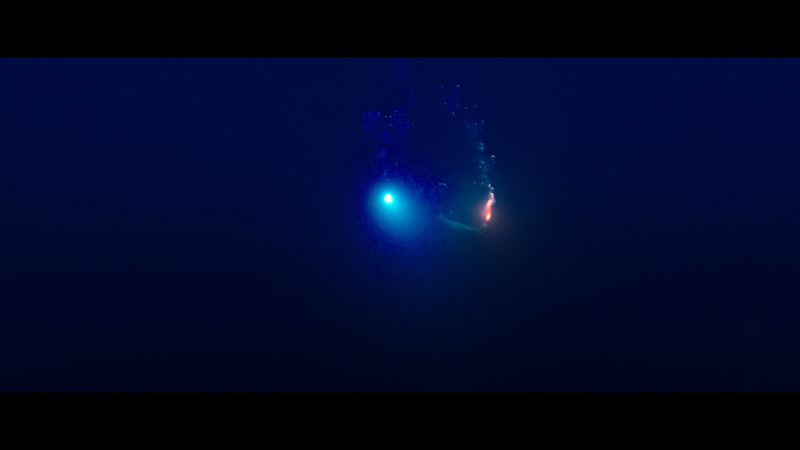 However, there were two issues going on: the first is many instances of banding as most of the movie takes place underwater so the transition of the shades of blue are quite obvious; the other problem I noticed is the actual blue in Holt’s mask which looks artificially pumped up, even enhanced in post where it looks like those parts hover over the shot, like it was CGI’d. The only reason I can think is the filmmakers needed to differentiate Holt and Moore while underwater, otherwise with the masks you couldn’t tell them apart. The disc comes with a basic and adequate DTS-HD Master Audio 5.1 track which is rather standard but there were moments, like when the two guys and two girls are on the dance floor, or a pivotal scene underwater, where the LFE channel really kicks into gear. The dialogue, even within the masks, is relatively clear. Again, not really all that dynamic but decent enough. Overall, 47 Meters isn’t that good of a movie but there were a few tense moments so even with a thin plot and mostly one-dimensional characters, this might be worth a rental especially considering its short running time, but don’t go in expecting a whole lot. The Blu-ray meanwhile offers a fine video transfer and good audio while the features are on the limited side.